Fifteen North Americans journeyed to Axim, Ghana in Oct-Nov 2006. We joined 13 Ghanaians of similar professional/vocational expertise and lived and worked together for 2.5 weeks. While in Axim, we engaged in communication and peace-building dialogs, sub-projects, and our “Legacy Project” — building an orphanage & community learning center. In preparation for the trip, delegates gave dozens of talks to hundreds of people in the Puget Sound region, including Rotary Clubs, schools, universities, churches, libraries, and community centers, exposing audiences to the culture, history, needs, and impact of AIDS in Ghana and West Africa. Began construction the first Orphanage/Community Learning Center, Western Heritage Home, in Axim, which will house 35 orphans. Raised $65,000, which will get the Orphanage portion of the building ready for occupancy. Raised $2800 to provide social welfare to the guardians/caretakers of 21 orphans, in preparation for assuming responsibility for their care, and to help with their school fees. Purchased 56 mattresses for the local Hospital in Axim by raising $4000. Brought many suitcases full of clothes, school supplies, calculators, soccer balls, books, toys, etc. One extra large piece of luggage full of clothes will be distributed to Axim volunteers as they work on orphanage building. Brought several routers and 4 desk computers for the planned ICT Center (information Communication Technology plus Internet Cafe) at the Community Learning Center we are building, plus a laptop for the hospital and for our Ghanaian Host project director. US and Ghanaian delegate computer whizzes laid the groundwork for an internet café to be installed in the orphanage. Brought medical supplies including sterile gloves and solutions, syringes. Women’s empowerment team organized a women’s session, including HIV and hygiene instruction as part of women’s empowerment in town of Axim, Okuno Village (attended by 48 women and men), and a nursing school. Offered a Women’s empowerment workshop to 147 women in business skills, time management, and HIV/AIDs prevention. Displayed a video of women using a “chorkor” to smoke fish. Toured, visited, and counseled in a Women’s Training Institute that trains dressmakers, hairdressers and other marketable skills. Organized and facilitated an all day Town Hall which brought 145 diverse townspeople together to brainstorm ideas for the future of their community and create initial action plans. Ran a Blog communicating our experiences in Ghana (http://gcjghana.blogspot.com). 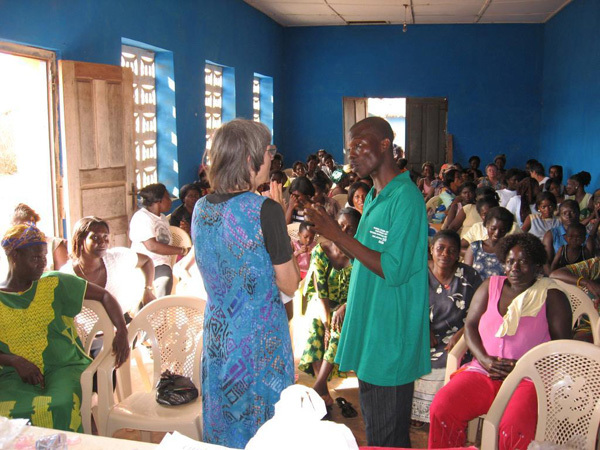 Demonstrated conflict resolution and forgiveness skills to the Axim Council of Elders. Visited a Muslim village to deepen understanding of Muslim people and cultivate relations. Preached in 2 churches, a woman’s evangelical organization (Women Aglow) and met with ministers about the orphanage and how they might support it. Two US and one Ghanaian delegate were teachers who gave science and civics classes to hundreds of Ghanaian students. They are engaging a US high school in ongoing pen pal exchanges with a school in the Axim area; song/letter exchange between a US Sunday school and students in the Axim area. The US teachers were given special awards from the school district for their support. Videotaped most of these activities and plan to create an educational/PR/outreach on video. Met with the Takoradi Rotary, the Kings of Lower and Upper Axim, US embassy officials, and Boeing and Coca-Cola representatives to discuss the project, needs of Axim, and funding for the Orphanage & Community Learning Center. Interviewed on several regional and national radio and TV shows, and wrote articles for in-country newspapers. Brought district civil engineers and water specialists together with US civil engineer to assess water and sanitation facilities. They are preparing grant applications for funding to build a water system for the 60% of the Axim population now using inadequate hand-dug wells. Participated in “circle time” to enhance leadership and team building, processing, custom writing, skill development, listening skills, sharing, inquiry, and reflection.